Inside the Bicutan detention centre. Picture courtesy of a former detainee. This week we reported that the Bureau of Immigration had vowed to toughen up the regime at its already notorious Bicutan detention centre. On Thursday (Thursday, January 24), BI Commissioner Jaime Morente announced that detainees would be subject to more “shakedowns” to clamp down on contraband in Camp Bagong Diwa, also known as Bicutan. He made the remark after BI personnel reportedly seized mobile phones, “sharp and pointed objects” and other prohibited items during a raid. Other items confiscated included mobile phones and accessories, portable air conditioning units, portable Wi-Fi devices, knives, steel tubes, scissors, laptops, DVD players, decks of cards and cigarette lighters. In response to the report, a group of detainees at Bicutan has released a statement, giving their account of the raid, and of the ongoing corruption at the facility. We the detainees of the Bureau of Immigration Detention Center in Bicutan wish to respond to the Bureau’s post about the recent supposed raid they conducted at this facility. First of all the Bureau of Immigration did not conduct the raid. There was no Bureau staff here other than the guards on duty. The PNP Regional Special Operations Unit (RSOU) did. Far from co-operating with the RSOU, [name redacted for legal reasons] gave over an hour’s advance notice of the raid to several of the wealthiest of the Korean criminals being held here, and even hid some of their phones, laptops and cash in his own office. The same phones were returned un-touched and un-reported after the raid. He has since allowed brand new devices to be brought in for other Korean criminals at a time when the Bureau is claiming all devices are contraband. Worse, he allowed the Koreans to send out some of their old devices which were being sought by the RSOU. Communications devices are not “contraband” in a facility of this kind, in fact detainees are guaranteed un-restricted access to such devices by international law and human rights treaties to which the Philippines is a signatory. That is one of the reasons why these Korean criminals pay to stay here. Of course, many of them can only afford to pay the bribes to stay by committing fresh crimes, a fact of which corrupt Bureau of Immigration officials are very well aware, and benefit from. The claim that the Bureau confiscated “weapons” is ridiculous. A couple of kitchen knives were all that was confiscated from the kitchen area, and those are permitted. They must be since the food provided by the Bureau isn’t enough to survive on and is completely lacking in most vitamins and minerals. We further wish to point out that “weapons”, such as they are, wouldn’t be a concern if the Bureau would stop illegally holding murderers and violent criminals with the general population. We have complained of this many times, with no results. 1. Trying to cancel out existing conjugal visits at the same time as he informed the Korean criminals of the new prices for bringing in prostitutes. He has even been allowing overnight prostitutes visits. The Bureau of Immigration personnel at the detention centre goes so far as to use Bureau personnel and Bureau’s official vehicles to transport prostitutes past the PNP guards at the main gate. 2. Confiscating all phones and laptops as “contraband”, including all such devices as officially registered in the Admin office, and returning only a very few of them. Then they allow the Koreans to buy and bring in new devices, for a price. They have even gone so far as to erect new internet connection antenna for the Koreans. They placed it over the Wardens office to escape notice if outside agencies conduct a raid. Many detainees had money “confiscated” during the raid. There is no law stating how much money a detainee in a facility of this kind may or may not have. We were never informed of any such regulation and were shocked when our money was taken from us. Now we are told we may not have more than P3,000. Many detainees do not have visitors who can come weekly or even monthly. We need to buy things like food and medicine, (note: the Bureau does not pay for any of our medical treatment). 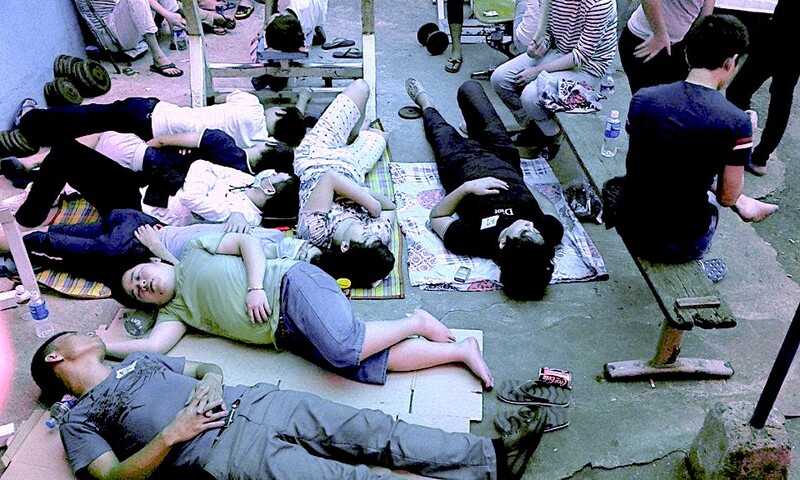 Some detainees need medicines that cost P1,000s per week. The Bureau of Immigration itself is the cause of the problem since they are functioning exactly like partners with the organised crime groups they are holding here, providing protection in return for a slice of the loot. Further raids and stricter security measures are ridiculous since the Bureau of Immigration itself is not only protecting but also enabling the criminals they are illegally holding here”.